Nashville Warbler on Bean Trellis in Winter. Moku Hanga Print by Ken Januski. For quite some time I've debated trying Moku Hanga printmaking. As best I can tell the term itself just refers to Japanese woodblock or woodblock printmaking. Most people will probably be familiar with it through ukiyo-e prints, such as those by Utamaro, Hokusai, Hiroshige et al. Though I've always liked those prints I suspect I first liked them more for their influence on the art of people like Edgar Degas than for any other reason. That is no longer the case but it was my first reaction to them. Now my interest is completely different. It is more related to things like the use of non-toxic materials(since the ink is water-based not petroleum based), the fact that it can be done without a printing press, though this has been true of all my other prints as well, that it has a registration system that most likely is better than the one I've used in the past, and perhaps most of all it is capable of a rich color, a color that actually is absorbed into the paper, rather than lying on top of it. Though I'd read the last statement before, the fact that the color merges with the paper, you actually need to see it to understand it. Now I have! 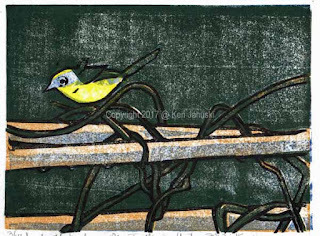 It can be seen in the two prints above and below of a Nashville Warbler on a Bamboo Bean Trellis in Winter, which we had in our backyard on and off over a two week period a number of winters ago. These two prints also show at least one of the problems with this type of printmaking: the background color, in particular, varies greatly between prints. I began printmaking about 5-6 years ago I think, though I had had a brief introduction in college. The more I've done it the more I remember why I shied away from it in college. Printmakers seemed SO interested in technique! At the time that was the last thing that I thought art should be about. But after my 5+ years of printmaking I realize that technique is an integral part of it, at least if you want to make an edition, i.e . more than one more or less consistent print of the same image. And given all the work involved, at least when I make a print, it seems silly to not have more to show for it than just one print. Still I don't like having to worry about technique. It's a necessity, not a virtue, not something I seek out. That said I've seen some moku hanga prints that are extremely rich in color and that is something that I think is desirable enough to more than compensate for the technical problems involved. At least I hope so! Time will tell. Another thing I love in many ukiyo-e prints is the sinuous, graceful line, based most often on the sinuous, graceful line of the original brush paintings on which the prints were based. For me there at two huge obstacles to doing this myself: first I can't do graceful, sinuous brush paintings, and to do so would probably take years of practice; and second, I'll never become such an accomplished carver of wood as to translate sinuous lines from paint to carved wood. In ukiyo-e prints this was no problem because the artist and the carver were two different people! And the printer was a third person involved in the process. This helps to explain some of the accomplishments of this type of print. And it also shows the difficulty of doing it today. 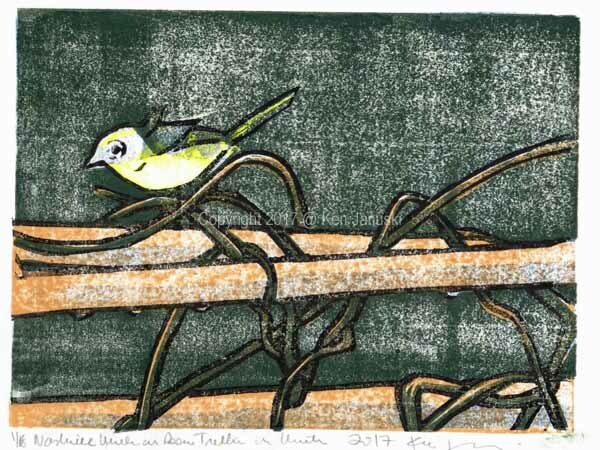 There seem to be quite a few contemporary Western printmakers using moku hanga today, each in their own way. From what I can see many skip the part based on graceful, sinuous lines and instead are more interested in rich color fields. I know of some art in this manner that I greatly like. But it's not for me, at least not at the moment. So crude as my lines might be I plan to continue to use them in my prints. Only time will tell how I come into my own interpretation of moku hanga. Above and below you see the first. All printmaking seems to require a lot of time in the studio. 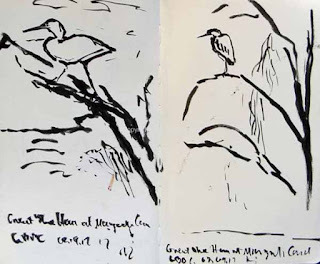 So I was happy a couple of times recently to leave prints and printmaking behind and head outside. 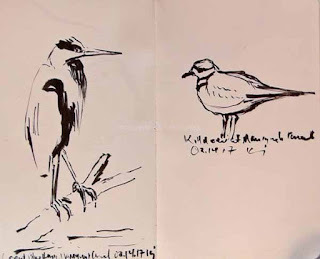 Below you see two recent field sketches. 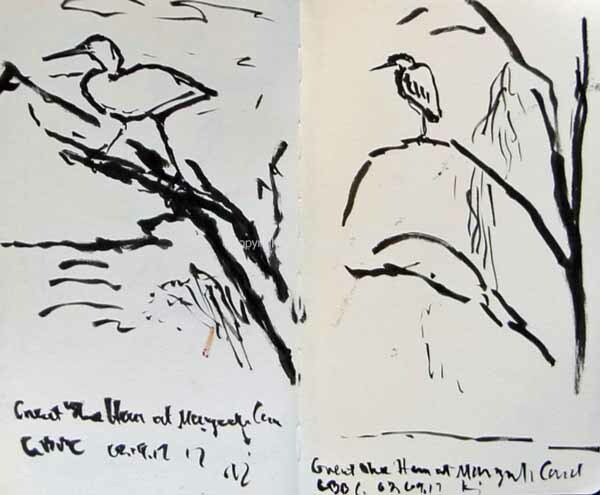 As you may be able to tell they are done with a brush pen, something that resembles a Chinese or Japanese brush but that comes with a reservoir of ink. It may be hard to believe but when I first started using them a year or two it was with the idea of developing the sinuous, graceful line that I talked about above. I find it far more refreshing that a labored pencil sketch, at least for myself. 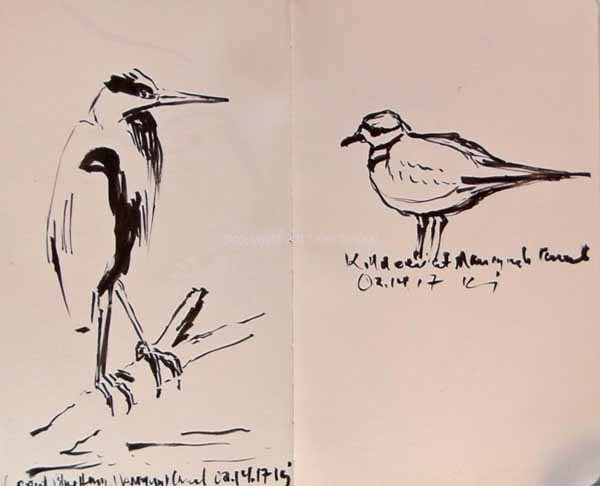 Great Blue Heron and Killdeer at Manayunk Canal. Brush Pen Field Sketch by Ken Januski. Two Great Blue Heron in Trees Along Manayunk Canal. Brush Pen Field Sketch by Ken Januski.